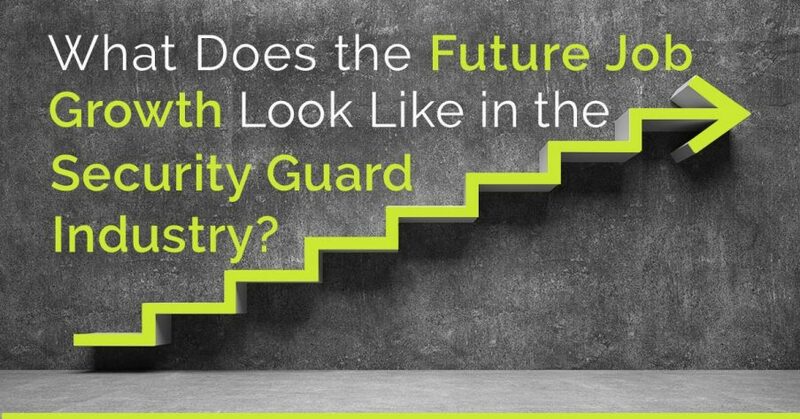 Perhaps one of the most challenging elements in the Security Guard industry is the ability to attract, onboard and retain talent. With high turnover rates, there is a growing need to ensure that you are keeping a constant flow of resources and talent flowing through your operations. Similarly, the costs associated with onboarding and training can cut into margins, which is why companies looking to effectively build a workforce management solution need to find ways to ensure they retain the right talent and minimize turnover. But what is the short-term and long-term projections for job growth in the Security Guard industry? Is there a pool of opportunities out there to make room for growth? The Projections Managing Partnership (PMP) has released projections on various industry and occupational outlooks. 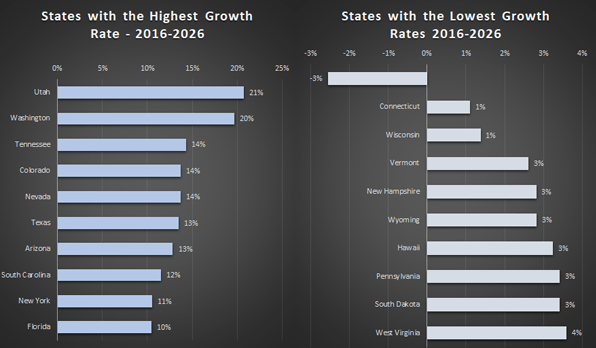 Funded by the U.S. Department of Labor, Employment and Training Administration, this group provides important statistical analysis on growth of industries across each state. We looked at the Security Guard outlook and found interesting analysis, both in Short and Long Term. As you can see, there is an average growth rate projected at 2% for all the US. This is a relatively low growth rate in the short-term. 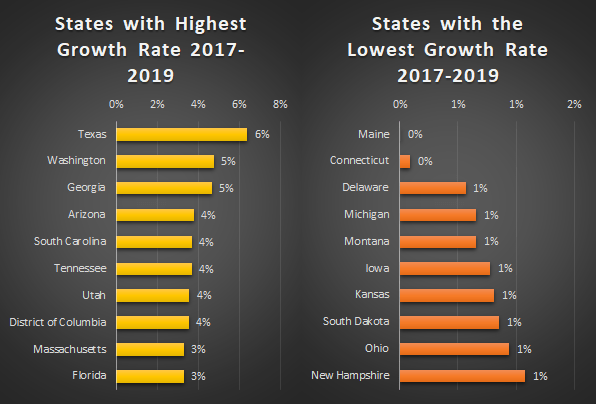 While some states have a higher growth rate, there is a trend towards flat growth. For the short term, this can be a challenge, especially with companies looking to grow their business, mitigate turnover risks and minimize onboarding costs. 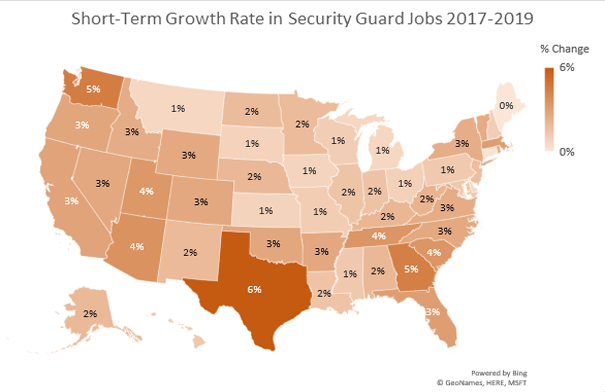 Some of the factors to consider in job Growth by state can vary, especially on state size and relative need for physical security. Larger states, such as Texas will have more need for Security Jobs, both in population and growth in industries that require security, such as Oil and Gas. Others can weigh in the situational factors, such as high-security locales, like the District of Columbia. The same can be said for lower growth rates, where lower populated areas with less need for securing facilities – corporate or federal – will factor into the equation. 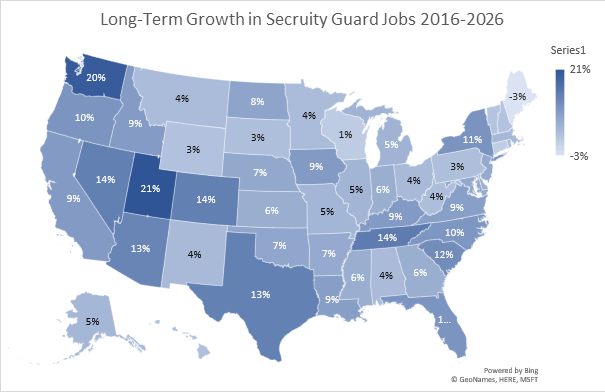 In the short-term, the takeaway is that in a time of relatively flat growth, there are certain states that prove more lucrative for Security Guard companies than other. This is a good benchmark when looking to invest in your business – which states will have a higher likelihood for growth in your business. While the short-term outlook tends to show a flat curve in growth, with an even distribution across states favoring more populated or facility-based needs, the long-term outlook presents a slightly more optimistic view. What is interesting about this outlook is that while the short-term average growth was hovering at 2%, the longer-term outlook is averaging about 7%, which is more than three times the rate. This appears to be an optimistic view in the market, which can be attributed to several factors. One is growth of the economy – as more and more jobs and businesses grow in the economy, the need to provide security tends to follow in this respect. There is also growing need to support state and federal initiatives, where guarding contracts can produce growth. What can we discern from this? There are a few factors to consider. The two factors to look at is type of industry that is supported and population growth. In the last two years, Utah has had the highest birth rate (with a relatively lower death rate) and the National average, and Utah tends to retain it’s youth, so over a ten year period, as population growth and population density increases, so does the need for security. Similarly, from an industry standpoint, Washington state is a growing technology hub for the nation and more and more jobs are being created in high-security facilities. Conversely, there is some consistency in these factors to illustrate the lower populated states with less need for facility security will ultimately drive job growth in a slower rate. The key here is that when there is population growth, or there is a booming industry that requires physical security to support it, the jobs will continue to grow there. Location Location Location: Depending on what factor you look at, there is a variance on security guards by state. This typically has little to do with the actual size of the state, but more in the size of the population and/or industries that inhabit that area. Certain Industrial Hubs Favor Guarding than others: Whether this is Tech industries, Federal complexes or industrial manufacturing, the central “hubs” that grow these types of business have a high correlation for physical security needs. Companies looking for consistency in their business should seek how industries that are on the rise and will need services to protect their assets. 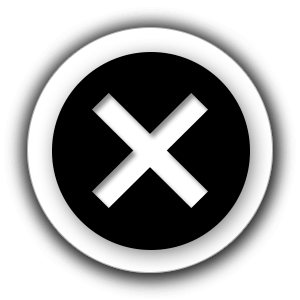 Population Density ties to Security: Simply put, more people – more need for physical security. As populations are growing, and businesses and locations need to support the growth, so too will the need to protect assets and the community. Security firms should examine what areas are growing faster than others and see if there is an investment worth making. Plan for Long-Term but Mitigate Risks for Short-Term: It’s nice to see an optimistic view on long-term growth, and while Security Guards isn’t the fastest growing industry, it is moving in the right direction (if projections pan out). However, this doesn’t mean companies sit back and wait. Turnover, retention and costs to hire and onboard are still major challenges. That is why companies need to find ways in the Workforce Management Solutions to drive more efficiencies in attracting and retaining talent, while keeping costs low. It’s an interesting way to predict and understand where jobs are growing, what areas they are growing and what the outlook by state will be in the next 8-10 years. While this outlook provides a nice snapshot into the future, it’s important for companies to look at their operations and understand how they can impact growth through operational efficiency, implementing Workforce Management Solutions, and ways to minimize costs and driving value, both in the short-term and the long-term.